You’ll be able to use the strobe directly on your camera via the hot shoe, or wirelessly as a Commander or Remote. Using the flash as a Commander allows you it to take control over other Nikon Speedlights, expanding your creative lighting options. 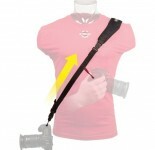 As a Remote, it can be controlled by another Speedlight, or your camera’s built-in flash. Its Quick Wireless Mode, with A:B light ratios, allows you to quickly adjust settings on multiple flash units — giving you the ability to control two remote units in i-TTL mode. It features a dot-matrix LCD control panel with an intuitive layout for easy operation. It derives power from AA batteries — supporting rechargeable NiMH, disposable Alkaline, and disposable Lithium cells. Recycle time is a scant 2.5 seconds when using NiMH, 3 seconds when using Alkaline. The SB-700’s Thermal Cut-Out detection prevents the flash from overheating. It increases the recycling time if the temperature of the flash head crosses a certain threshold, preventing the unit from becoming damaged. The strobe includes hard plastic-type color filters for fluorescent and incandescent color temperature balancing. When you use these supplied filters, the flash is able to recognize which filter is installed, adjusting the white balance automatically on compatible Nikon DSLR cameras. It also features an AF-assist illuminator lamp, which helps to speed up the autofocus of your camera in low-light situations. The SB-700 supports three illumination patterns — standard, center-weighted, and even — for use in different shooting situations. Standard mode provides conventional flash coverage. Even mode covers the subject with even light across the entire frame, perfect for group photos where even illumination is desired. Center-weighted mode directs the light to the center of the frame, creating a vignette around your subject that is suitable for portraiture. i-TTL Speedlight optimized for use with Nikon’s Creative Lighting System (CLS). 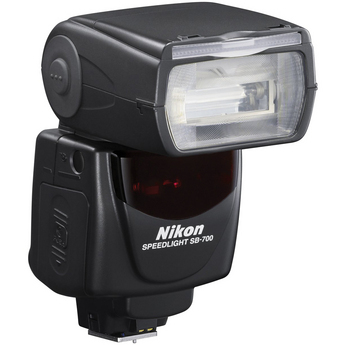 Delivers precise flash exposures and seamless fill-flash performance-even in challenging lighting situations. Coverage Smoothly covers lenses as wide as 24mm and up to 120mm in FX-format. To prevent overheating, flash recycle time increases when SB-700 detects heat build-up.